Scott Sommerdorf | The Salt Lake Tribune The Chinese community honored Chinese immigrants who built the railroad from the west by posing more than three busloads of people into a photo at the Golden Spike National Monument on the 145th commemoration of the completion of the transcontinental railroad, Saturday, May 10, 2014. Washington • The House on Monday passed Rep. Rob Bishop’s legislation to designate the Golden Spike National Historic Park in northern Utah, elevating the status of the location that connected the transcontinental railroad. While not the same as a national park, the designation would make Golden Spike the 52nd national historic park and highlights the prominence of the less-visited spot. Other national historical parks include Abraham Lincoln’s Birthplace in Kentucky, Appomattox Court House in Virginia and the Harriet Tubman Underground Railroad. Bishop’s legislation, which passed on a voice vote but still needs Senate approval, also establishes the Transcontinental Railroad Network, which allows for historical signage of railroad sites to raise awareness about the importance of trains in the 19th Century. 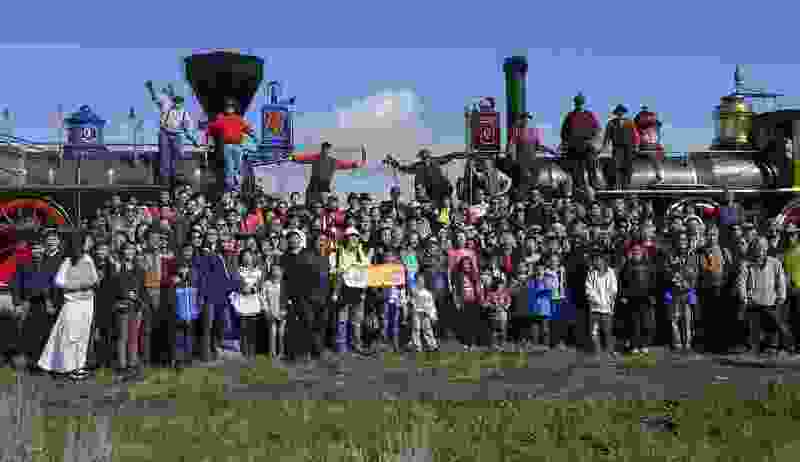 “The Golden Spike National Historic Site retains an unparalleled concentration of historic railroad engineering features and preserves the stories of the diverse people who built the world’s first transcontinental railroad,” Bishop said Monday. In introducing the bill, Bishop said the historic park designation would draw attention to a moment that changed the world. “This new park will not only preserve the history made on that spring day in 1869, but also the herculean efforts which led to the driving of the spike and the new course of history that followed,” Bishop said then. Golden Spike is currently a national historic site and managed by the National Park Service, which would continue to oversee the area under the legislation. Sen. Orrin Hatch, R-Utah, is sponsoring a companion bill in the Senate, though it has yet to be voted out of committee.